If you recall the rugged landscapes illustrated in Maurice Sendak’s classic book, Where the Wild Things Are, you can well imagine the rustic, untamed, and thoroughly enchanting topography of the Roussillon. Shaped like an amphitheater and nestled in the South of France between Spain, the Mediterranean Sea, the Pyrenees, and the Corbières Mountains, the Roussillon region (or Languedoc-Roussillon more properly) is less than two hours North of Barcelona by train or car. 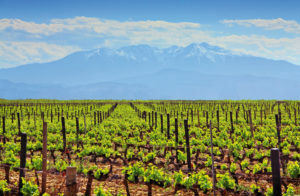 But what truly sets the Roussillon apart from other wine regions of the world, is its historically sweet, fortified wines called Vin Doux Naturel (VDN). 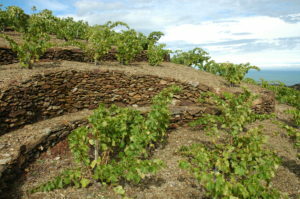 The viticulture of the Roussillon was established by the Greeks in the 7th century BC, then further developed by the Romans. Yet the most significant event in Roussillon winemaking took place in 1285 with the invention of the process of mutage (adding alcohol) to make Vin du Naturel. Vin du Naturel starts off like any other wine with an alcoholic fermentation, but the difference is that halfway through fermentation, the winemaker adds grape spirit (pure neutral alcohol derived from wine – 96% abv) to the must. This stops the fermenting action of the yeasts before they have converted all the sugar into alcohol. The wines are then left with significant residual sugar and elevated alcohol ranging from fifteen (the minimum) to eighteen percent. Vin Doux Naturel can be made in a wide variety of styles and colors, depending on three key factors. First is the grape variety or varieties utilized. Second is the length of time the wine matures in a vessel (glass, tank, or wood of various sizes), which could range from months to decades. And the third factor is if the desired style requires that the wine is protected from oxygen, or deliberately exposed to both oxygen and the sun in order to achieve caramel and toffee aromas and flavors. Three appellations make up the producing regions for VDN wines. Rivesaltes, Banylus, and Maury. Differences amongst them emerge from grape varietal and aging requirements. One of the more popular styles of VDN in the international market is made from the deliciously floral and fragrant Muscat grape in the Rivesaltes region. Here, the wine undergoes the mutage process, resulting in a pale colored white wine with roughly 15.5% alcohol and 105 grams per liter of residual sugar. The natural acidity of the grape and protective measures taken during the winemaking process keep acidity vibrant, so the sugar does not seem at all cloying. Briefly matured in a neutral stainless steel vessel and protected from oxygen, this fresh youthful wine smells and tastes of freshly picked honeysuckle. 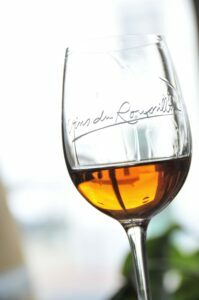 The style is a specialty of the Rivesaltes appellation and is a great wine to sip as an aperitif to pair with a light dessert such as a fruit tart. 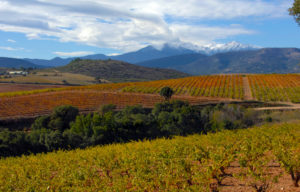 Red fortified VDN made from a majority of the Grenache Noir grape is produced in every appellation of the Roussillon and comes in two basic styles. 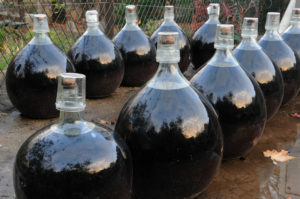 Both styles undergo the mutage process, but the difference is basically that in one style, the wine is protected from oxygen, and in the other style oxygen interaction is encouraged. Protecting the wine from oxygen results in a deeply colored purple/black wine with vivid aromas and flavors of fresh black and blue fruit (blackberries, blueberries, cassis) that is delicious to pair with a dessert such as chocolate cake. These seemingly exotic wines can typically be found for under $20 dollars, making them a great choice for surprising and delighting friends and family when entertaining. In terms of the deliberately oxidized style, the best example can be found in the appellation of Banyuls, a distinguished appellation for Vin Du Naturel based on it’s offering of Grand Cru and its steep terraced vineyards, just a brief drive up the hill from the artistic seaside resort town of Collioure.Grand Cru Banyuls is made primarily from the Grenache Noir grape (at least 75% to qualify for Grand Cru). For this qualification, the wine must spend at 30 months in oak. Typically, however, the aging period is much longer, with the wine spending as long as 30 years aging in giant wooden vats. The best place to take a tour and see the process is at the famed, large cooperative Cave Abbé Rous/Terres des Templiers in Banyuls Sur Mer, near the town of Collioure. Maury is another famed appellation for VDN from the Grenache Noir grape. With its dramatic hills and valleys, the landscape of Maury is as wildly untamed as its famed VDN wine known as “Rancio.” (Think bitter and nutty in flavor). This deeply colored brown wine is made in a deliberately oxidated fashion in which the wine matures under the sun out of doors. The wine sits in wood vats or glass jars called BonBonnes, with the purpose being to hasten the development of oxidative caramel, coffee, and toffee aromas and flavors. Vin Doux Naturel from the Roussillon are among the finest sweet wines in the world, on par with Sauternes and Tokaji, and quite a value for the effort that goes into their production. Producers are passionate about keeping the tradition of VDN, yet at the same time are putting increasing focus on dry premium wines, primarily made from the Grenache grapes (Noir, Blanc, and Gris). A good example of one such winery is Domaine St Sebastien which makes dry wines from the Collioure appellation and also has a restaurant and tasting room nicely located in the colorful walking village of Collioure. The dry white wine they make, a blend of Grenache Gris and Blanc, is matured in new French oak and tastes like the finest Burgundy. They offer two red wines, one from vineyards in the mountains and one from vineyards closer to the sea, to express their unique terroir. Fortified wines are not all that the Roussillon region has to offer though, it’s a stunning place to visit all year round! Some of the most famous artists in history were inspired by the region’s beauty. Hop in the car and head to the seaside resort town and artist colony of Collioure to take in the same perfect light that tickled Matisse, Picasso, and Dali’s creative fancies. Then head Half an hour southeast to find the charming town of Perpignan which is home to some fabulous restaurants and art museums. Hiking and biking are popular all over the Roussillon as well, and in winter one can even ski in the Pyrenees Mountains. No matter where your exploration takes you, it’s pretty much a guarantee that you will be both visually delighted and palatably pleased in the Roussillon. • A car is essential, as distances between wineries and other attractions can be considerable. Be certain to verify opening hours (which vary according to the season). As an alternative, consider deciding on one or two wineries to personally visit, and experience the vast array of Roussillon wines at tasting rooms such as Le Café Fefe in the charming seaside resort of Collioure. • The Roussillon is known for its scenic hiking and biking routes. In order to make the most of your visit, connect with your hotel before your trip. Villa Duflot, for example, has a trail nearby, as do some winery guesthouses. • Note that trains travel to Perpignan from Barcelona, Montpellier, and the Languedoc several times a day, widening international travel options. There are many direct flights daily from Paris to Perpignan as well. This is a delicious Ambre colored sweet wine that well represents the Rivesaltes region which spends over six years aging in large oak vessels. This was a very good year. Though by law this only needs to be aged 30 months, this wine is aged six years and has incredible concentration. This is a very classic example of a sweet wine from the Maury appellation, made from 100% Grenache Noir grapes. It spends a year out of doors in glass BonBonne jars then is taken indoors and aged in large Foudres (casks). Villa Duflot This is a gorgeous 4-star hotel just outside of Perpignan with a fabulous gourmet restaurant overlooking a sleek illuminated pool. Central in location, this is a well-run economy hotel with a friendly front desk staff and substantial buffet breakfast. This restaurant, now run by a charming young couple, offers some of the most creative cuisine in the Roussillon. Atmosphere very sleek and sophisticated. Charming, very central to everything,well-run, quaint and romantic. Romantic seaside restaurant with elegant cuisine. Popular wine bar with wines from all over the Roussillon. This well run cooperative offers tours and tastings. Check the website for specific hours that change according to the season. A restaurant called Le Jardin de St. Sebastien, which faces the sea, is attached to the Domaine St. Sebastien tasting room in Collioure. This winery also offers rooms. Walking Tours are available, depending on the season. This winery also offers guests rooms, and walking routes to tour the vines. This winery is one of the oldest and most famous in the area where you can taste and buy wine. They are starting to offer wine tourism experience “packages” which you can view here.